There are numerous cardinals in our immediate vicinity lately, and the 3-Ds have cottoned on to this. So for this photoshoot, they wanted to wear their cardinal hats to try to lure in a stray cardinal or two (or three). Dante is wearing a custom hat (modelled on that of a bellhop, of all things) appliqued with cardinal heads. 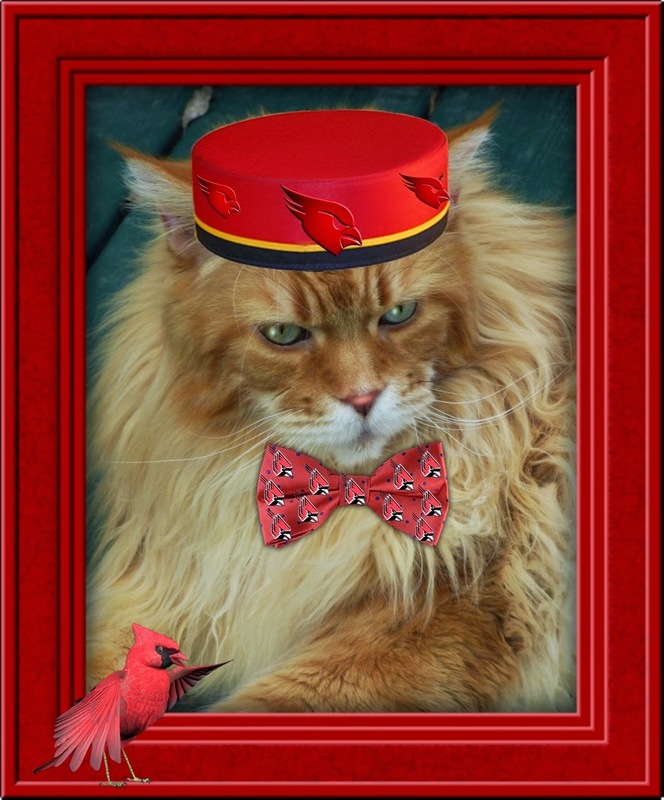 He is also wearing a bowtie replete with red birdie heads. You can certainly see where this is headed! The real cardinal isn't impressed at all, unfortunately. "It looks like you decapitated all my friends! I fink it's about time you decapitated yourself, Dante. Take off dat fing and frow it away!" Dylan also has a hat and tie adorned with cardinal heads, but fortunately he hasn't gone overboard. 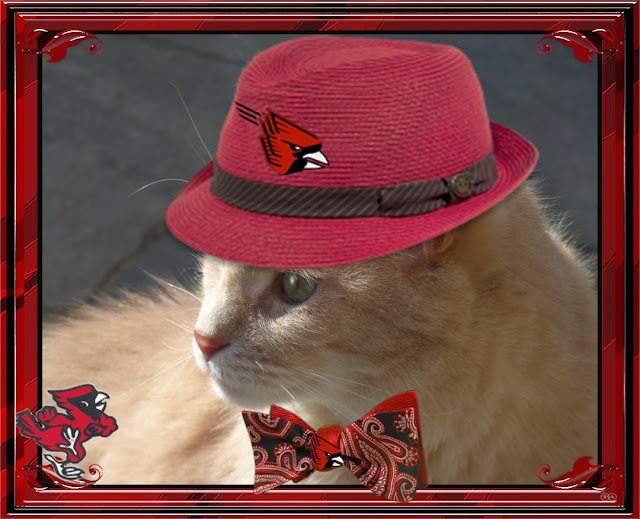 His cardinal friend is dancing at the sight of Dylan in his red straw cardinal fedora and jazzy red and black bowtie. "Yoo makes me wanna sing!" warbles this lively cardinal. "I likes yoo verrrrry munch" replies Dylan. 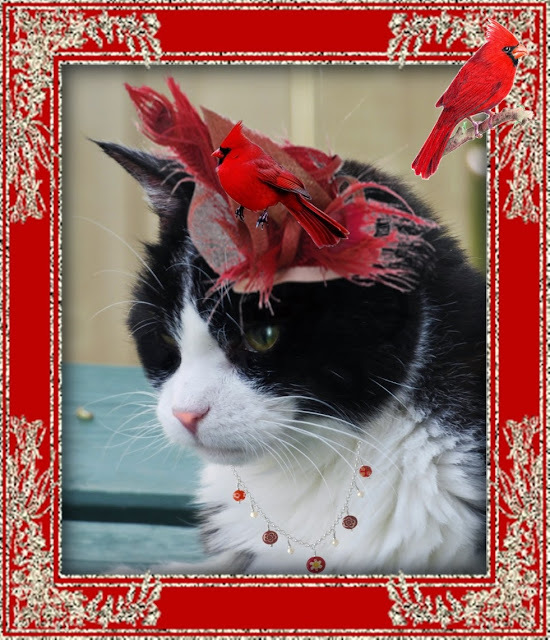 Domino is wearing a bright red and taupe fascinator with a feathered arrangement. It coordinates well with her red glass pearl necklace. Domino is the most successful of all of the 3-Ds in attracting cardinals. The one on her head actually thinks it's a nest! Soon she could have a whole family of the red ones nestled in. But she best stay very still. 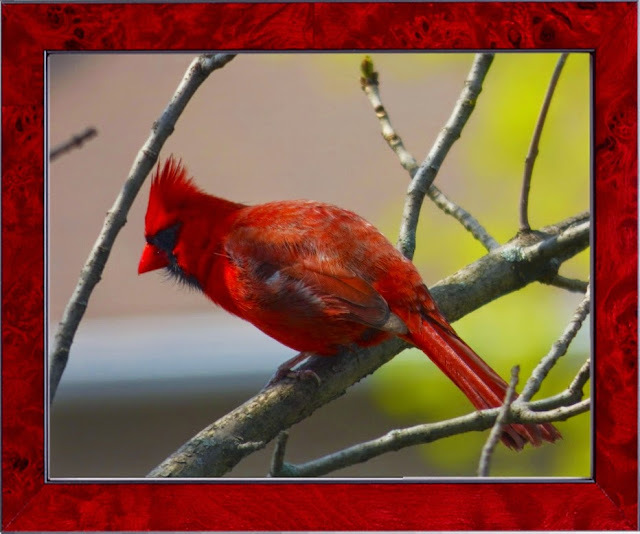 This is a picture that I took of a cardinal in our budding crabapple tree the other day. Cardinals are such gorgeous birds with their vivid red feathers and striking black mask! I hope that all of my kitties are ultimately thwarted in their cardinal seducing endeavours, don't you? The world is better and more beautiful because these lovely birds are in it.